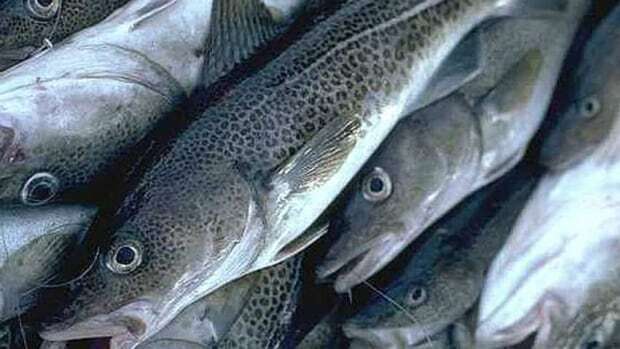 The federal government has cut in half the cod quota in Nova Scotia as the once abundant species continues to struggle. Scientists overestimated the stock's rebound after the quota was previously cut in half four years ago. "It does amount to a cut of 50 per cent. There's no other way to look at it than the quota has been cut in half," said Stefan Leslie of Fisheries and Oceans. The cod stock remains in poor shape on the Scotian shelf from Halifax to Digby, leading Fisheries and Oceans to spread the annual 1,600-tonne quota over two years. Scientists found this year's catch brought in fewer younger fish. "If they do grow, they hit age four or five and they seem to disappear," Leslie said. "In our surveys at age five or six, they are practically non-existent." Scientists don't understand what's happening to the fish. Haddock and cod are managed in the same way, but cod remains in trouble while haddock booms. The seal herd has grown by 20 per cent in recent years, and the health of that predator could be hurting their cod prey. Cod is a by-catch, meaning fishermen seeking species such as haddock can keep cod that are caught accidentally. In some areas, trawlers use separator nets to let cod escape. For more than 20 years, a moratorium has prevented cod fishing off the eastern shore, but a limited amount was allowed off the southwestern shore. The last cut didn't lead to a recovery. "The assumptions we had to make several years ago about what level of fishing would allow [us] to rebuild didn't pay out. Fishing mortality remained high. The stock didn't rebound," Leslie said. The next full assessment of the area's cod stock will come next year. At its peak in the mid-1980s, Canadian fishermen were hauling in 266,000 tonnes of cod each year under continuously more generous federal quotas. Foreign trawlers fishing off the 200-mile limit were supposedly limited to 36,000 tonnes by international agreements, but were routinely sailing home with almost three times that amount.